There are some days when you feel like standing out. You want to wear something with a little extra oomph. If your closet is leaving you less than inspired, neckwear could just be the missing element in your wardrobe. Neckwear is a fairly foreign concept to most women. Now I’m not talking a tiny little gold chain or rayon scarf. I am talking bold, unique statement pieces that can only be found in a marketplace like Etsy. Whether you are looking to set the next fashion trend or break out of your shell of shyness, these fabulous Etsy finds can help you achieve your fashion goals. 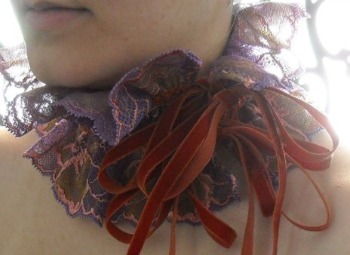 This dramatic neck ruffle is made from a rare and intricate soft French lac and tied together with two rows of cognac orange velvet ribbons. 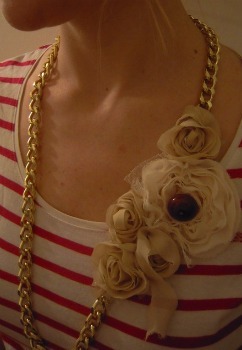 It would be perfect for adding a romantic flair to your work attire. Just pair the ruffle with a plain black or beige pant or skirt suit and a white button down shirt, leaving the top few buttons open. 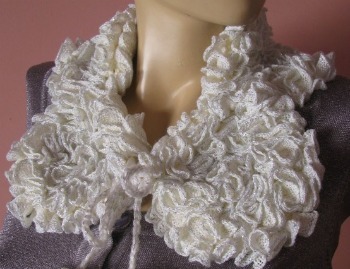 This elegant neck shawl is crocheted from soft, white acrylic ruffle yarn with silver thread. It would be a great pairing with a low cut evening gown or satin cami. 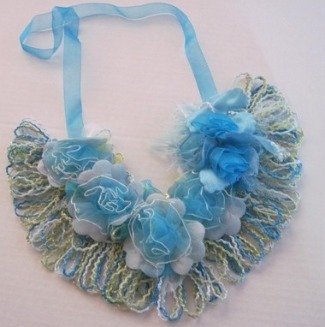 Here is a floral bib made of ribbon flowers and yarn. I especially like this one because it has more of a casual feel. I would wear it with a white or lightly patterned crewneck or V-neck tee. This necklace boutonniere displays a delicate arrangement of ivory and beige chiffon flowers with a maroon button center and is offset by the chunky gold-plated chain. This is a versatile piece that can dress up a refined outfit or bring a little funk to a casual one.